It's been forever since I last posted. Actually, it's been over a year! I started homeschooling Sept of '09 and there went the blog. So it's a new year and a new chance to start sharing my projects and thoughts. It is snowy here in Maryland so I thought I would share some snowflake creations. First some snowflake fondant cookies. I used basically the same techniques as previously posted for fondant cookies, just used snowflake cutters. Second, I created some fun beaded snowflakes magnets for a kids project for an Orphan Hosting Farwell party. They were a hit and super simple. These could easily be made as ornaments but that season has passed for this year! I will post directions to the snowflake magnets if anyone is interested. Let me know with a comment. 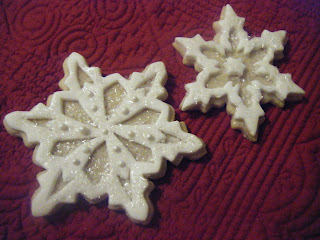 Oh, I forgot to mention that I used a gelatin type edible glitter as a final accent on the snowflake cookies. I just lightly wet the fondant using water on my finger and sprinkled with the glitter for a wonderful snowy effect!